It is now in V2 and the script was updated to contain the same features as the Sunbird library. 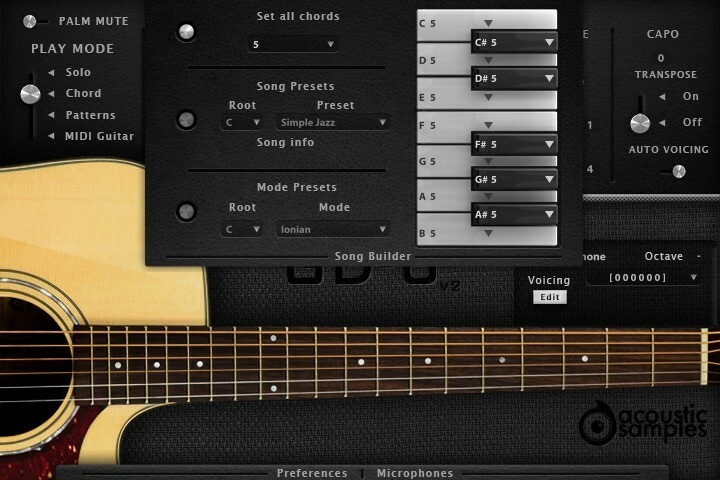 There are basically 4 modes (that you can choose using keyswitches, G5 to C6), the solo mode that allows to play melodies, the chord mode that helps playing strums or picking very easily, the patterns mode that does all of the strumming or picking for you and the MIDI mode that allows you to use your preffered midi guitar controler. 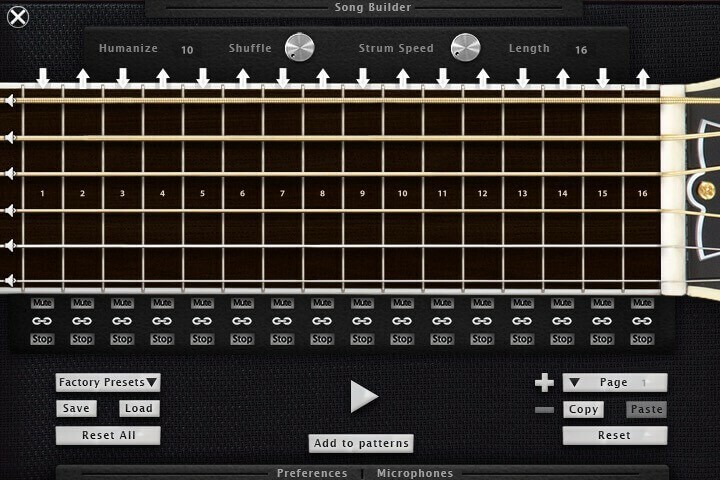 All of these details allow us to reproduce the real playing of a guitar player, and easily. 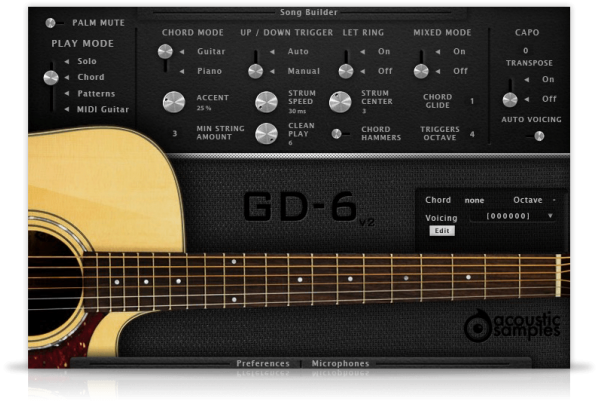 The GD-6 acoustic guitar can strum, in various ways, up, down, muted, in legato and allows picking. Everything is modeled after meticulously analyzing thousands of real chords played by guitarist. Every aspect of the strumming engine can be tweaked to achieve the sound you want. Make sure that you check the patter maker video from the Sunbird library to get an idea of how it works. 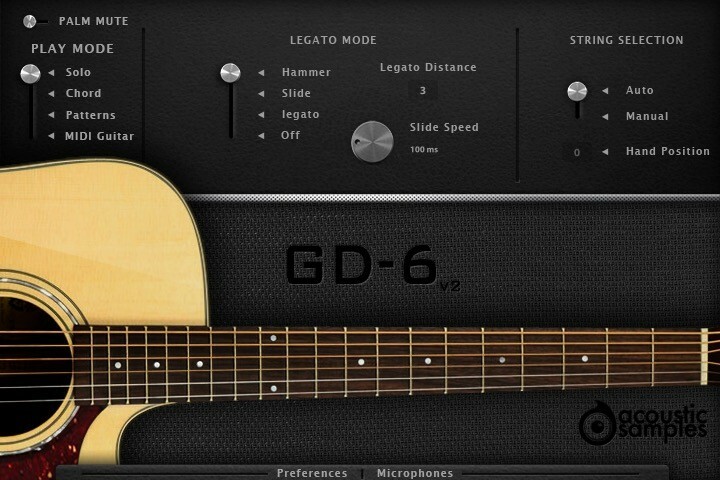 The GD-6 acoustic guitar features our powerful legato engine that will automatically trigger legato, hammer ons, pull offs, or slides and the legato distance will define the maximum interval in which the legato will apply. 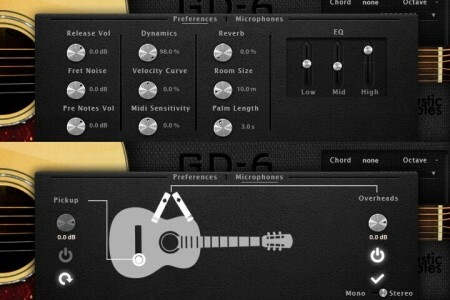 The GD-6 acoustic guitar library comes with 2 microphones perspectives, a stereo pair and the DI output and you can adjust the volume of each of them. The Preferences panel / Microphones mixing panel can be opened by clicking at the bottom of the interface, in there you have access to all of the different parameters of the library. The Reverb Amount and Room size are two simple controls for the UVI SparkVerb, and you can tweak it a little more using the FX section in UVI Workstation. You can load / unload / enable / disable / and change the volume of each microphone perspective. You can also set the whole output as mono or stereo. 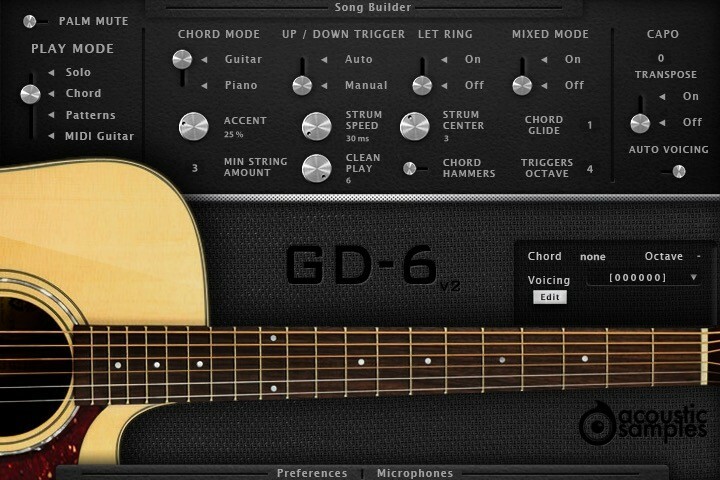 The MIDI guitar mode allows you to play the GD-6 acoustic guitar using a midi guitar controller, all you need to do is select the 6 midi channels. You maybe have to use the set patch as omni to allow the plugin to respond to all midi channels. GD-6 Acoustic Guitar comes with its own sample player, the UVI Workstation 3 (requires v3.0.0 or later). I am an owner of one the acoustic guitar products sold by acoustic samples. While the samples are excellent , so are the demos , I really find it hard to create the same level of demos that are advertised. I would really appreciate if acoustic samples also provides demo MIDI files so users can get to know how to use these instruments HANDS ON . love this software. great detail, wonderfully overtones and a wealth of features that I haven't begun to master yet. if you are looking to add acoustic guitar backing tracks using your keyboard, you can't do much better than the GD6. It has a clean but warm tone that should be useful in just about any genre of music. 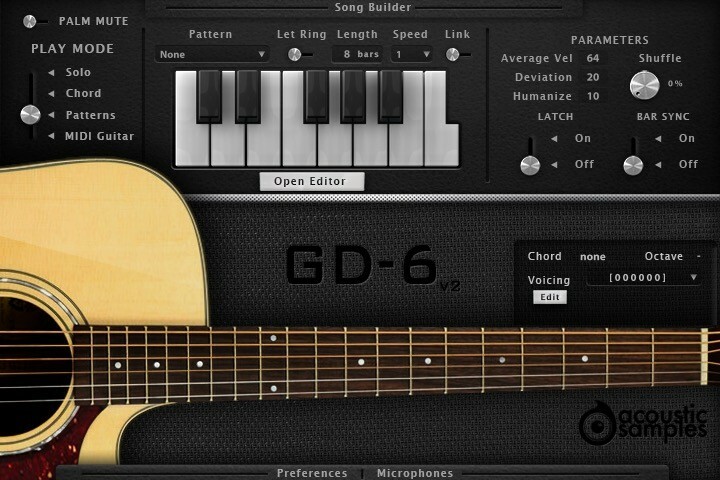 I only wish piano vet's could sound as realistic as the GD 6. Great, natural sound. A wealth of options. However, there is one thing that bothers me. When you are basically a keyboard player and have selected Solo mode, you sometimes tend to go too low on the keyboard with your left hand. If those keys (D1 and below) were silent, it wouldn't matter much. But all too often I hit the D1 or C1 key and as a result get an unwanted percussion sound. This is even more accentuated by the fact that there is no barrier between the lowest normal key (E1) and the highest percussion key (D1). I think it would be a great improvement if those special percussion keys optionally could be disabled in Solo mode. Still, it is a rock solid piece of software.